Due to a federal government shutdown, the North Carolina National Guard is operating with minimal personnel to ensure essential missions and operations are continued. The NCNG remains ready and available to respond to all emergencies within the state should the governor call on the Guard during this federal government shutdown. Questions regarding reporting to work with the NCNG, attending military schools, or IDT drill, contact your NCNG supervisor and/or unit commander or NCOIC. The North Carolina National Guard has resumed normal operations and all employees should return to work today, Tues. Jan. 23, 2018. Contact your supervisor for additional information. 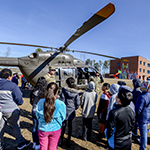 RALEIGH, NORTH CAROLINA -- Soldiers with the North Carolina National Guard’s 449th Theater Aviation Brigade (449th TAB) landed a UH 72 Lakota Helicopter on the field at Rogers Lane Elementary School, January 31, 2018. The Soldiers were invited with the help of the school’s Personalized Learning Coach, Heather Collins, whose husband is the commander of the 1-130th Attack Reconnaissance Battalion, 449th TAB, as part of a career and character event for the students at the school. Goodies donated by N.C. companies were turned into love & support for deployed N.C. Guard Soldiers thanks to St. Stevens Lutheran School students, NCNG Soldiers & Airmen Assistance Fund members & local business executives in Hickory, N.C, Jan. 31, 2018. Retired NCNG leaders and members of Soldiers and Airmen Fund Air Force Col. Steven Martin and Army Sgt. Maj. Dennis Roach, Col. Drew Goodwin helped plan the event at Hackney Service Merchandisers, a local company, with Hickory businessman and retired Army Reserve Command Sgt. Maj. Dean Cline Sr.
CAMP TAJI MILITARY COMPLEX, Iraq – EXERCISE, EXERCISE, EXERCISE!! Flames burn in the midmorning as Coalition forces call out for help after a simulated gas bottle explosion during a mass casualty training exercise, Jan. 18, 2018. U.S. Army Soldiers assigned to the 449th Combat Aviation Brigade and Coalition soldiers from New Zealand, Singapore and Australia work together to simulate a real-world training scenario. 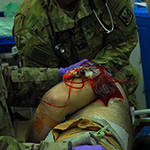 The exercise provides a hands-on experience in a combat situation if a flood of wounded patients came to the Camp Taji Role One Enhanced Medical Facility. ​ SOUTHPORT, N.C. -- Dozens of 18-wheeled M915 tractor-trailers rolled into Military Ocean Terminal Sunny Point (MOTSU) after a nearly 300-mile convoy from the North Carolina National Guard's 1450th Transportation Company headquarters in Lenoir beginning their annual training deployment for Operation Patriot Bandoleer, here on August 17, 2017. 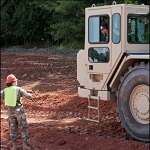 ​FLETCHER, N.C. – Thanks to a partnership with the North Carolina National Guard and the North Carolina Department of Agriculture and Consumer Services (NCDA & CS) additional parking spaces will be available at the Western North Carolina Agricultural Center (WNC Ag Center) here.